VIZ Media Opens 2016 with "Honey So Sweet"
VIZ Media Announces "Bloody Mary" and "Honey So Sweet"
VIZ Media Announces "Honey Blood"
Nao Kogure was in middle school when she left her umbrella and a box of bandages for a fellow student who was injured. Little did she know that she would meet that student again in high school. His name is Taiga Onise, a delinquent, and Nao wants nothing to do with the gruff and frightening teen boy. However, Taiga suddenly presents Nao with a huge bouquet of flowers and asks her to date him – with marriage in mind! Is Taiga really so scary, or is he a sweetheart in disguise? As Honey So Sweet, Vol. 3 (Chapters 11 to 15) begins, Onise plans to celebrate his two-month anniversary with Nao. Trouble is on the horizon, however. Onise's friend, Ayumu Misaki, wants Nao to be his girlfriend. Misaki is so bold that he tells Onise that he is going to take Nao away from him. Honey So Sweet Volume 3 interjects a romantic male rival. This tart is no dessert, as creator Amu Meguro pushes “the other guy,” one who just might take Nao away. I don't really believe that, but the storytelling is good enough to make me worry. I do find this Honey So Sweet. As always I am an easy mark for shojo high school romance. 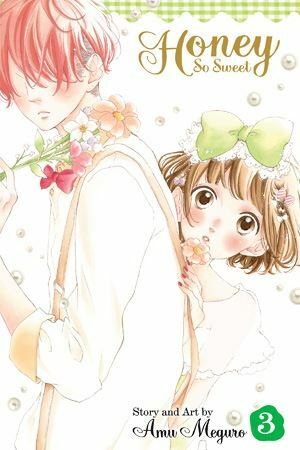 POSSIBLE AUDIENCE: Fans of “Shojo Beat” high school romances will want to try a taste of Honey So Sweet.